Blu-Ray Review | "Mildred Pierce"
Joan Crawford earned her first and only Oscar for Michael Curtiz's towering film noir, in which she plays a mother determined to give her spoiled daughter the lavish lifestyle she demands at all costs. Mildred Pierce takes the classic Hollywood women's picture and turns it into a dark, noirish melodrama, examining issues of class and feminine ambition. Shot during WWII but released after the war ended, the film was made at a time when women were joining the workforce in record numbers. Pierce's daughter, Veda, is embarrassed by her hardworking mother, even when her success gives her the means to give Veda (Ann Blythe) the high class life she craves. Veda is cruel, manipulative, and vain. Mildred is tough and hardworking, willing to trade in her dignity in order to provide for her children. The men in the film skirt around the periphery, especially the three men in Mildred's life - Wally (Jack Carson), a well-meaning lawyer whose naked affection for Mildred makes him the perfect patsy for her ambitions; Bert (Bruce Bennett), her first husband, who sees Veda for what she really is; and then there's Monte (Zachary Scott), a penniless heir from a wealthy family whose duplicitousness threatens to tear mother and daughter apart. 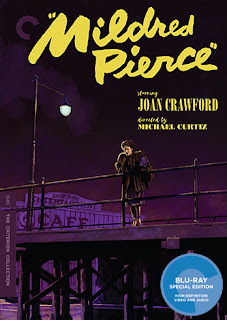 Mildred Pierce is above all a tale of just how far a parent will go to protect and provide for their children, but more than that, its an examination of class prejudice and society's disdain for working women, even successful ones. It was a film ahead of its time, taking the melodrama of the novel and turning it into a hardboiled, female-led noir, where the women aren't femme fatales but working stiffs willing to do what it takes to achieve the American dream. While Crawford is never really believable as a working girl, her magisterial presence in her severely squared off fur coat anchors the film with a kind of raw anguish that is hard to shake. The film looks glorious on Blu-Ray, its inky-black shadows creeping in on Mildred like her daughter's unchecked evil. With her every whim catered to, Veda is cinema's ultimate spoiled child, an ungrateful wretch who can't even see the irony of her own degradation as a showgirl, which she sees as perfectly acceptable over her mother's restaurant business. 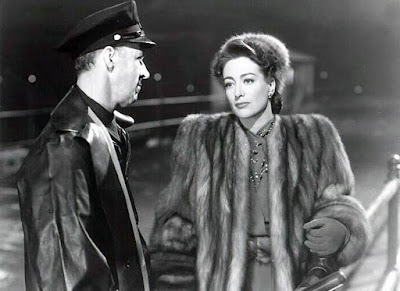 In that regard, Mildred Pierce is a cautionary tale for parents, where overprotected children become monsters and the hard work parents put into raising their children goes unappreciated. It remains one of Hollywood's great melodramas, a rich and psychologically astute work whose power still resonates today. Now on Blu-Ray and DVD from The Criterion Collection. Blu-Ray Review | "The General"/"Three Ages"